100 Sheets of Liberty Legal Watermarked Security Paper. 3 hole drilled. 500 Sheets of Liberty Legal Watermarked Security Paper. 3 hole drilled. 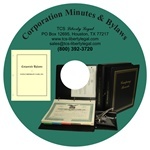 MS Word version of our Corporation Minutes & Bylaws on compact disc which can be used for all 50 states. Instructions are included for search and replace making customizing a breeze. Preprinted (you fill in) generic Corporation Minutes & Bylaws which can be used for all 50 states. Printed on 20 lb. Liberty Legal watermark security paper. MS Word version of our LLC Company Agreement on compact disc which can be used for all 50 states. Instructions are included for search and replace making customizing a breeze. Preprinted LLC Company Agreement (you fill in) which can be used for all 50 states. Printed on 20 lb. Liberty Legal watermark security paper.